September 11, 2001, changed us all, whether we were in New York or Washington or Pennsylvania or thousands of miles away. But why should a media institution commemorate the tenth anniversary of those attacks with a series of public programs? First, because the media were an integral part of the experience of that day—first in bringing us the news, then in infusing it with context and meaning, and finally in uniting us and bringing us whatever small measure of comfort we could find in the communal viewing experience, administered by the paterfamilias of the time: the television news anchors. But even beyond that, media is a reflection of who we are—as we change, so does media. Think about it: prior to the 9/11 attacks, foreign news was being phased out by cost-conscious news executives; many of us had never even heard of the Taliban or Al-Qaeda. In the years since we have heard about them not just on news programs, but also on crime and espionage shows like Law & Order and 24 and even comedy programs like Late Show with David Letterman and The Daily Show (both of which went dark on 9/11 and the days after, but eventually returned with passionate, inspiring monologues by their hosts). When the entertainment community sought to rally the public on behalf of the victims’ families and rescue workers, they proposed a telethon—America: A Tribute to Heroes—that changed television history. It was simulcast on over thirty-five broadcast and cable outlets in the U.S., plus 8,000 radio stations and America Online, in addition to numerous overseas outlets, and it raised over $200 million. The Paley Center’s slate of 9/11 media-themed programming revisits the events of that day not just to commemorate, but also to take stock of how we have changed and what we have learned. Admission to the Paley Center will be free for everyone on September 11, 2011. The 9/11 attacks and their aftermath produced an overwhelming amount of TV & internet programming. Is there one moment that stands out to you: the Concert for New York? When Letterman came back on air? A documentary about the building of the towers? Tell us which media moments means the most to you and why. Copresented by The Paley Center for Media, NY1, and Tribute WTC, this public event commemorating the tenth anniversary of 9/11 will feature remembrances and insights from the men and women who covered perhaps the most harrowing event in New York history for the city’s quintessential journalistic outlet, NY1. The NY1 team will not only reflect on the logistical, emotional, and professional challenges they confronted on that day and in the days after, but also discuss how their professional lives and indeed their entire profession changed as a result of these events. The panel will also tackle the wider issues of what role the media played as events unfolded, and also in the ensuing days, weeks, and months. We will explore the vast changes in media production and consumption over the past ten years, and all the ramifications these changes would have on coverage of a similar emergency today. Free to Paley Center Members and the General Public. Please book a seat. We invite New Yorkers and visitors alike to come to the Paley Center to watch the tenth anniversary commemoration activities at Ground Zero live in HDTV on the giant screen in our Bennack Theater. We suffered through that day together; now we offer a place where people can gather to honor those who were lost, together. 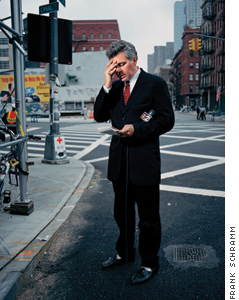 As part of the Paley Center's September 11 commemoration, we will present an exhibition of portraits of journalists reporting from Ground Zero in the early days following the attacks. Photographer Frank Schramm witnessed the attacks himself from a distance of less than five-hundred yards. He captured the journalists on the West Side Highway day after day in images of personal moments as they collect their thoughts or read their notes before going back on the air to bring news and information about the destruction and chaos to the world. The images draw attention to the efforts of the journalists to establish a controlled environment for the camera, sometimes by building makeshift outdoor studios. They highlight an emphasis on formality and lighting that contrasts with the desolation surrounding the journalists and their crews. Because of the lack of visual representation of the Twin Towers, the photographs have a timeless quality. It is only by looking at the titles—dates starting on September 15, 2001—that we learn what this series represents: the beginning of the post–9/11 era. Free for Paley Center Members; included with general admission. After the events of September 11, the Paley Center worked with broadcasters from all over the world to see the reporting of the attacks through the lens of other cultures. We now have a collection of more than five-hundred hours of coverage of that day and its aftermath from around the world, including France, Russia, Australia, China, Iran, Cuba, India, Spain, Pakistan, Israel, and Qatar. These programs are available in the Paley Center’s library. The Paley Center also has many documentaries about 9/11, as well as video from numerous public seminars we held looking at the media and September 11, beginning in February 2002. You can watch any of this collection material in the library at the Paley Center in both New York and Los Angeles. Plan your visit to NY or LA.